These 8 days tour will cover 4 western districts of Bhutan; Paro, Thimphu (capital), Wangduephodrang and Punakha. We will discover scores of historical sites and wonderful places such as Taktsang monastery, Punakha Dzong and the scenic Gangtey Village. 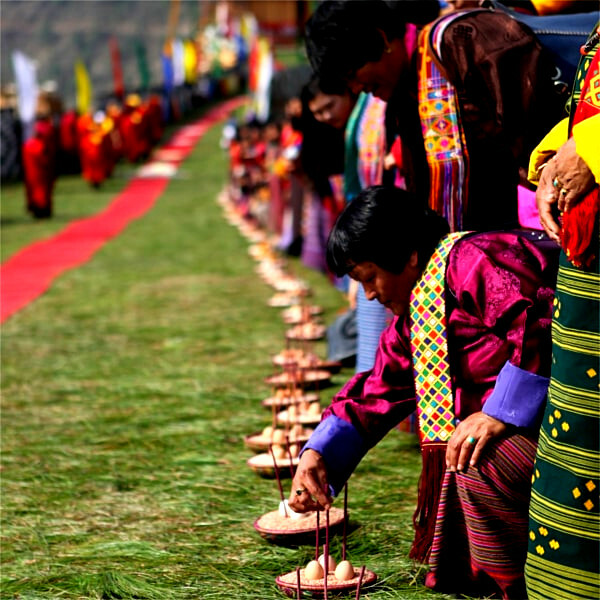 Representative from See Bhutan Travels will welcome you at Paro international airport. Get transferred to your hotel and enjoy your lunch. In the morning drive till Taktsang base from where the 6 hour round trip hiking to Taktsang monastery begins. 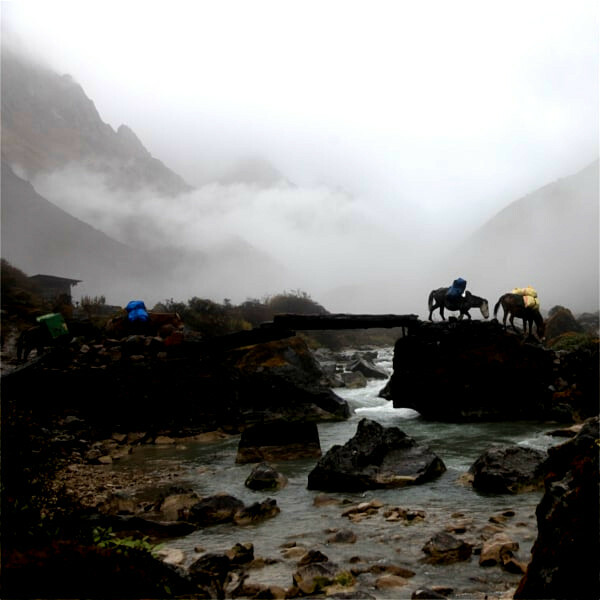 Horse riding facilities are available till Taktsang viewpoint while hiking up. Taktsang Monastery: The monastery is located 900 m above Paro valley on the face of a rocky cliff. Taktshang is perhaps the most famous monastery in the country. The monastery was named Taktshang after Guru Rinpoche flew there from Kurtoe Singay Dzong (Eastern Bhutan) riding on a tigress to subdue a demon. Gyalse Tenzin Rabgay, the secular head of the country (1680-1694) has begun the construction of the monastery at this site in 1692 and completed in the year 1694. The monastery houses many temples that contain sacred statues of eight manifestations of Guru Rinpoche, Tshepame Yabyum and Bone relic of Pelgi Singay. Towards evening, after reaching back from Taktsang monastery, we will visit to Kichu Lhakhang. Paro Kichu Lhakhang: Located about 10 minutes’ drive from Paro town, the temple is one of the two among 108 temples built by Tibetan King Songtsen Gampo in the 7th century to subdue a demon that lay supine across Tibet and Bhutan. The temple contains sacred relics dating back to the 7th century like a statue of Lord Buddha and four statues of Chagtong Chentong. It also contains the statues of Guru Nangsi Zilnon, Dolma Kukuli (a manifestation of Tara), Zhabdrung, the bone relic of his Holiness Dilgo Khyentse Rinpoche. Today we will be riding 65 km eastward towards Thimphu (capital). After arriving at Thimphu we will visit to following sites (In tour vehicle). Memorial Chorten: Located in the heart of Thimphu city, it was built in 1974 by Her Majesty the Queen Mother Ashi Phuntsho Choden in memory of her son, Third King Jigme Dorji Wangchuck. The three-storey choeten houses several relics such as Phurba Lhatshog, Kagay, Khrowo Nampur Gyalwa, Guru Tshengye, and Khenlop Chesum. The choeten is today the spiritual nerve centre of the city. Punakha is located 77 km east of Thimphu. Ride to Punakha from Thimphu includes uphill riding till Dochula pass (23 km) and from there; it is a downhill riding till you reach near the bank of Punatshang Chhu River. En-route to Punakha we will pay visit to Khemae Lhakhang, the monastery dedicated to Tibetan saint Drukpa Kuenley. After reaching Punakha we will pay visit to Punakha Dzong. In the morning we will hike to Khamsum Yelley Namgyal Chorten (stupa). Khamsum Yelley Namgyal Chorten: Located in Kabesa Gewog, about 7 km drive from Punakha town; the Chorten was built with the sponsorship of her Majesty the Queen Mother Ashi Tshering Yangdon Wangchuck between 1992 and 1999 under the guidance of Dilgo Khyentse Rinpoche and Lam Sonam Zangpo. The three-storey choeten contains the images of Dorji Phurba on the ground floor, Khrowo Khamsum Namgyal on the first floor, and Khrowo Nampur Gyalwa on the second floor. On hiking back from the stupa, your raft will be ready waiting for you. There are two rivers where you can enjoy rafting at Punakha, Pho Chhu River and Mo chhu River. Rafting distances are around 12 km on both the rivers and it takes approximately 2 hours on both the rivers. Depending on your choice we can raft on either or both of the rivers. Towards evening enjoy riding around Punakha valley. After early breakfast, we will start our journey towards Gangtey valley. Riding towards Gangtey from Punakha will be demanding since it involves uphill riding but for those who cannot ride all the way can always use the service of tour vehicle. If time permits, we will pay visit to nearby local villages and mingle with local farmers. Today is a long ride back to Thimphu. On the uphill roads we will be using the service of tour vehicles. Our cycling journey will come to an end at Thimphu. From Thimphu we will drive towards Paro for the night. After breakfast, your guide and driver will see you off at Paro international airport. One way to explore Bhutan is by riding a bicycle. Nestled at the foothills of Himalaya, Bhutan is amongst the most culturally and geographically diverse country in the world. Scenically breathtaking, with age-old culture and traditions preserved through generations, perfect way of discovering Bhutan is from the saddle of a bicycle. 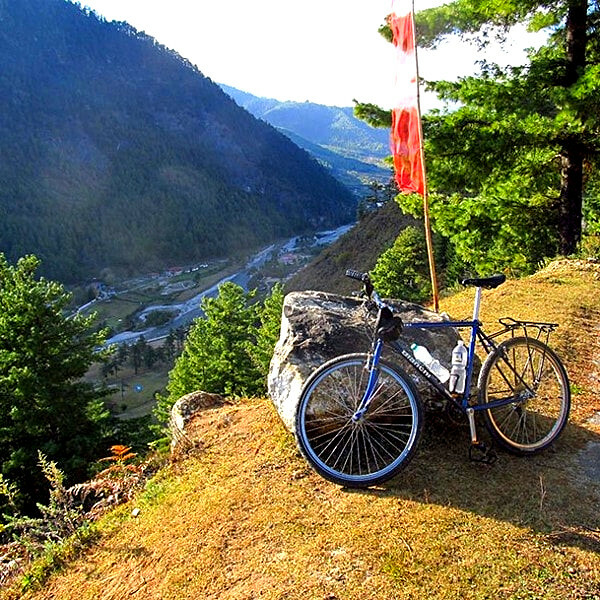 Be it beginners or professionals, riders of all level can enjoy cycling in Bhutan. All the required accessories such as helmets and extra tubes are included in tour packages but it is advisable that you bring your own helmet, saddle and toe clips of your size. A pickup truck or back up vehicle (for larger groups) and tour vehicle will be following you for your entire tour. For those who do not wish to ride for longer distance, uphill roads or those who cannot keep pace with their fellow riders can use the service of tour vehicle, while their bikes are carried by back up vehicles. For longer duration tours, a guide and a separate mechanic will be following you for the entire tour and for shorter duration tours, guide with a mechanical knowledge will follow you. Extra charges will be levied for hiring bicycle, if you want your guide to ride alongside with you. Otherwise your guide will be travelling in the tour vehicle. Except summer season (June, July and August) during which Bhutan receives heavy rainfall, rest of the year is suitable for cycling in Bhutan. With cooler temperature and less rain; October, November, December, March and April are the best month to visit Bhutan for on-road bicycling tour.